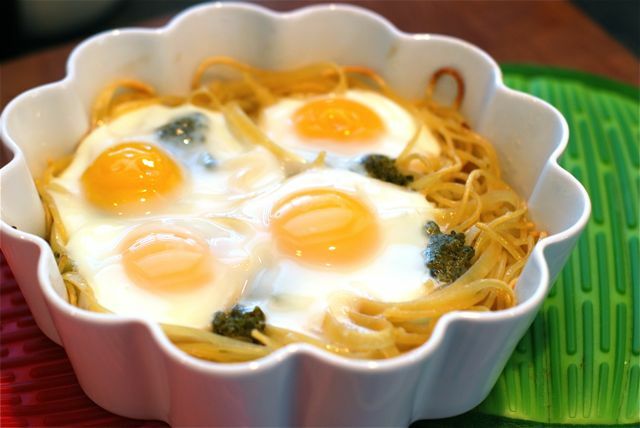 This is baked eggs in pasta nests dish is one of those meals that meets many needs in our house. It is great for meatless Mondays, it is a good way to pull together a quick meal with a few cabinet staples, and it can even be made for brunch! Yes, there are many reasons that we pull this recipe out time and time again. It is so good and SO easy. Once you get used to making it try adding more flavor with fresh basil or dots of goat cheese. My personal favorite thing about it is how the barely set egg yolks coat the pasta and make a sauce almost like a light carbonara. No matter why you make it, just do it. It is guaranteed to become your new favorite everyday dish this season. Step 2: In a larget skillet melt the butter over medium heat. Then, add the lemon juice, white wine, and cracked pepper. Bring the mixture to a simmer until it has reduced by half. Step 3: Take the pasta and twirl it in skillet until it is completely coated with the butter sauce. Step 4: Transfer the pasta to a baking dish---I use a 9-inch round dish. Make 4 wells in the pasta and gently crack the eggs into each one and top with a sprinkle of salt. Dot the pasta with pesto if desired. Step 5: Bake the dish for about 15 to 18 minutes, or until the eggs are set and the whites are completely cooked. Remove from oven, sprinkle with Parmesan, and serve.